Women desire to live well. However, living well in this modern world is a challenge. The pace of life, along with the new front porch of social media, has changed the landscape of our lives. Women have been told for far too long that being on the go and accumulating more things will make their lives full. As a result, we grasp for the wrong things in life and come up empty. God created us to walk with him; to know him and to be loved by him. He is our living well and when we drink from the water he continually provides, it will change us. Our marriages, our parenting, and our homemaking will be transformed. Mommy-blogger Courtney Joseph is a cheerful realist. She tackles the challenge of holding onto vintage values in a modern world, starting with the keys to protecting our walk with God. No subject is off-limits as she moves on to marriage, parenting, and household management. My thoughts: I.loved.this.book. It has earned a permanent spot on our bookshelf. Courtney is so down-to-earth and so awesome. She has a huge heart, and her heart is set on Jesus. 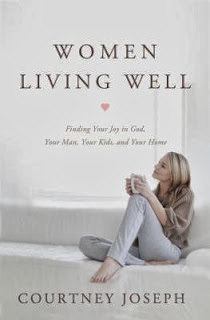 If you're a mom, if you're a wife, if you're single, you can benefit from this book. She tackles real-life issues, like social media, which this mama and wife needed. She has fantastic ideas for all areas of one's life - homemaking, marriage, finding time to be alone with God, parenting. One quote I particularly loved was: "Will the world change your children, or will your children change the world? The answer to that is in your parenting." The book is broken into four sections, and the section on marriage was really wonderful. Included is a 10-day challenge for wives to complete for their husbands. I plan to re-read this book and complete the challenge for Jason. If you completed the Love Dare, it's similar to that. In short, I really can't recommend this book enough. I implore you to pick up a copy today. If you don't see it at your local library, ask your librarian to order a copy! If you have the means to, purchase a copy. You definitely won't regret it. Thank you so much for this kind review!!! You blessed me today! Thank YOU for commenting and being an awesome light for Jesus!